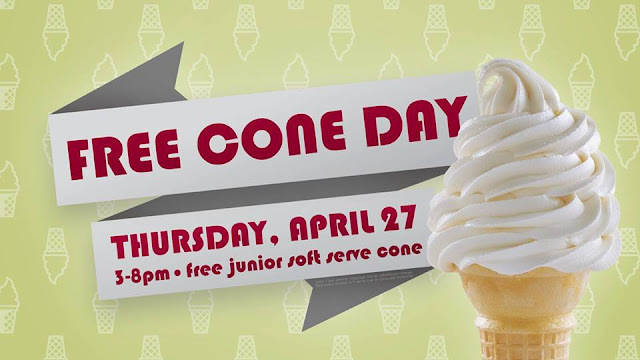 Savvy Spending: Free Junior Soft Serve Cone at Carvel on 4/27! Free Junior Soft Serve Cone at Carvel on 4/27! Carvel is kicking off ice cream season by celebrating their annual Free Cone Day on Thursday, April 27, from 3-8 p.m. Guests who visit participating shoppes will be treated to a FREE junior soft ice cream cone filled with their choice of freshly made vanilla, chocolate or Cookie Butter – Carvel’s newest, limited-time flavor, inspired by the irresistibly creamy, spreadable treat from Biscoff Cookies! For more info, visit the Carvel Facebook Event Page.